In Thailand and other Southeast-Asian countries, in addition to regular sweet potato and regular yam, purple yams are also popular. Although usually deep-fried, this recipe bakes them, which means they're healthier plus simpler to make for most North American cooks. 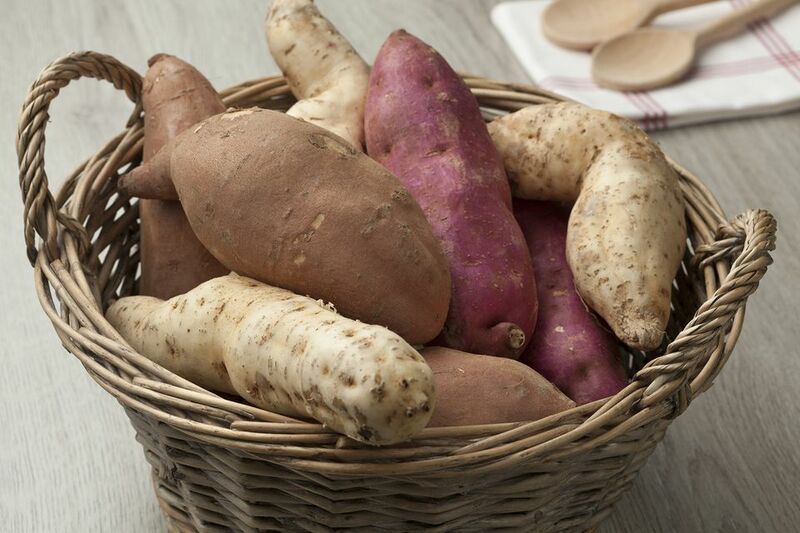 Purple yams can be found at most Asian markets in the fall as well as some organic stores, but sweet potatoes and regular yams are just as delicious. Carrots are good mixed in too! Just toss with a little oil, add a few spices and pop in the oven for 45 minutes. So easy, so good, and it makes a beautiful side dish to any fall or winter dinner table. Guests love this dish! Do a taste-test, adding more salt if desired. Add more syrup if you prefer them sweeter. If it's too sweet or too salty, add a squeeze of lemon juice. Garnish with the coriander and chili (if using), and ENJOY!